I fell in love with them a few years ago. I saw them walking down the street, arm in arm. 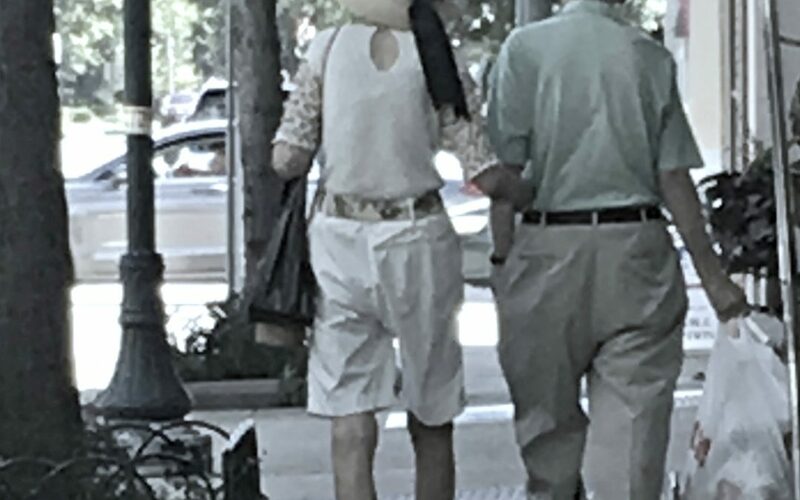 She’s always dressed with her hat and matching purse. He’s casually dapper. To me they are class and grace, and I imagine they have these soulful, connected, amazing lives that you’ve never seen, yet somehow feel. I don’t want to bother them yet I’d love to stop them, buy them coffee and hear about their life. I look at them and they give me hope and a glimmer into my future – that one day my husband and I will be like this, walking around town arm in arm, happy and in love, reflecting on our life together. I’ve let my kids in on my adoration of “my couple.” My daughter will be out and come running home saying “Mom, I saw your couple!” And she knows it will make me smile. The other day I was having coffee with a girlfriend when I suddenly saw them. I interrupted our conversation to tell her about my fascination. I learned my friend is enamored with them as well. We began to talk about the stories we imagine about them. I dream they met when they were young and have this soulmate love. They dance together to Mack the Knife and have very civilized yet simple dinners in their apartment. They watch TV in the evening or read in silence. Each morning they have breakfast together, put on their dress clothes and walk to town for their daily walk and errands. I’m not sure if they have kids. I worry about them during the cold months and pray they don’t fall. My friend has a similar story, however she thinks they met later in life and are enjoying their love in their twilight years. While my friend and I chatted, my couple started to walk toward us. I darted my eyes as if they were movie stars I was dying to stare at ,but didn’t want to get caught doing so. Then we dared to make eye contact with them as they walked by us. They didn’t disappoint. They engaged with us in very cheery pleasantries about the beautiful day. And then they were off on their walk throughout town. I do not “know” this couple. I have never had a significant conversation with them. Yet, when I see them I get happy. I get happy because of the love I see. I get happy because of the story I tell myself. It inspires me in my marriage. It inspires me in my relationships with others. And it inspires me in my relationship with myself. It also reminds me how our stories affect us. Our story can lift us up or bring us down. It can push us forward or pull us back. It can help us to love or it can cause us to hate. It can stop us or start us. It can instill fear or it can inspire tenacity. your husband doesn’t listen to you? your boss is holding you back? you’re stuck in your job or marriage? when you reach a goal, then you’ll be happy? your layoff was a blessing in disguise? your divorce led you to meet the partner of your dreams? an unfortunate event made you and your family closer? you were able to serve and help others after going through the fire and pain yourself? What is your story doing to you and for you?